This is probably the last Frugal GM post of the year and this isn't an obvious selection for a "Free" GM Resource. 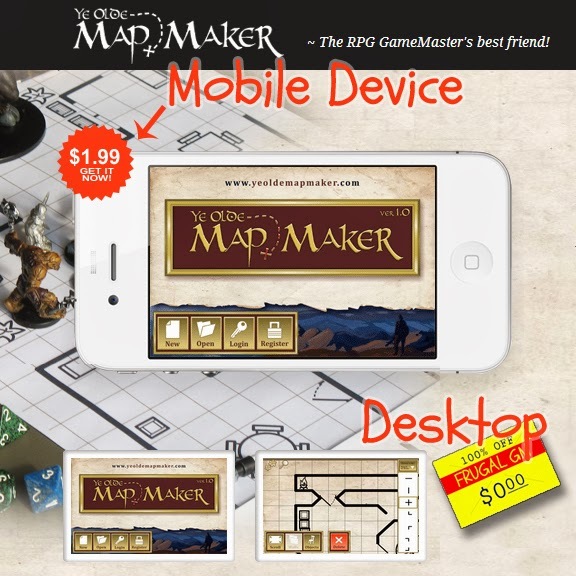 Ye Olde Map Maker is an inexpensive app for iOS and Android, but it also has a free-to-use desktop/web version. This program lets you create rather simple maps for use now or later. You can easily edit your maps, save them, or even share them. ......that means you can use other people's maps as well! Hopefully you realized this before you read it. In many ways this is a mobile version of the MIA program Dungeon Crafter. Sure, it doesn't have as many tiles to play with, but the ability to share maps more than makes up for it. I've noticed they've been rolling out updates so the program is getting better over time. I've just started playing around with the Ye Olde Map Maker and while I doubt it'll be my go-to program, the fact that I could start a map at home and then use my iPad when I'm out & about to work on it later sounds great.